Not the best movie I saw this year, but my favorite for sure. The FP feels like a movie that shouldn't exist. With it's creation, it's almost as if we're ushering in an era of "anything is possible" movies, which is one of the most exciting things about this movie. The thing with artistic technology is that, when it's created, only those with a lot a money get to use it, or decide how it's used. Think Photography. Heck, think Painting. All the incredibly early stuff is beautiful, but all the risks the early artists took were either minute changes in the common style, or subtle hints at their true motive that they were unsure would ever be noticed by anyone. Then, as the technology became more widely available, the number of artists not only increased, but the number of risks being taken increased. A really easy way to visualize this is by thinking about the history of recorded music. The early recordings were an awful lot of jazz standards and classical music. From there, the technology became minorly more accessible, and people started taking one or two risks (granted, they were safe bets, but bets none the less) and recording "hillbilly music" (Appalachian folk, roots blues, etc). Move up the years and you get rock and roll groups, leading up to punk music, hip-hop, grunge, "indie" rock, various forms of electronic music, all leading up to the current era of music production where having a polished sound is easy enough to get on a small budget that the aesthetic of lower quality recordings has made a ... come back ... if you can call it that. This trend can easily be seen in relation to movies. More and more movies are coming out with staggeringly low budgets ... but that doesn't mean that summer blockbusters are going to be easily crafted at home any time soon. The difference between the gradual democratization (maybe "increased accessibility" are better words) of music recording technology and movie making technology is, frankly, making movies is still currently more difficult. Camera's still need good lighting in order for the picture to come out "right," you still need actors who can evoke some sort of emotion, and then you have the combined difficulty of putting in the right music. Sure, you can cut those things out entirely, but that is going against the point (and heading down the trail of an entirely different argument: What makes a movie a "movie?" Is a 5 minute youtube vlog a "movie?" What separates that 30 second shot of your nephew playing football from Transformers? Is this a movie? 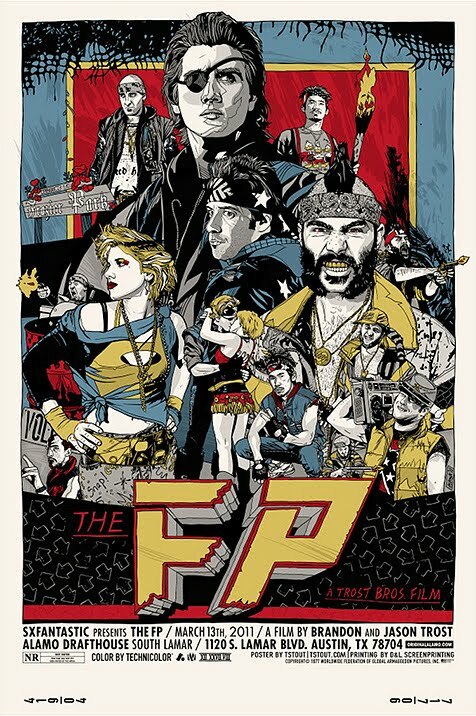 The FP is the kind of movie that shows that we, eventually, will be able to have full length feature films that are comparable to the slag we're handed on a weekly basis from big studios. Which means a few good things and a few bad things. The main good thing is that we'll have a greater variety of movies out there ... and the bad thing is that the ratio of good to bad movies will probably remain the same. So instead of just having a whole bunch of crazy good movies coming out, we'll have an enormous amount of movies coming out, and it'll be even harder to find the "good" ones. BUT, the cool thing is that we'll be able to decide what that means for ourselves. Which, again, brings us back to The FP. I don't know very many people who would like this movie as much as I do, and that's okay, because I think it's "good," and that's all that matters.